Wouldn’t it be nice to fill your emergency fund, plan a big trip, or just have a little extra money in your pocket in only 10 days? 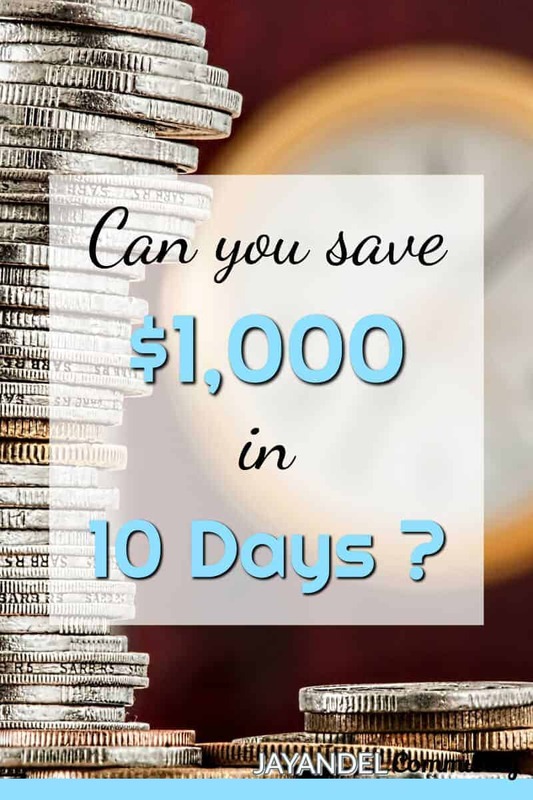 What if I told you that you can start saving $1,000 in just 10 days? You might think I’m crazy, but it can be done! Saving money can seem like an uphill battle. It’s not fun, in fact, it’s a bit boring and it can feel like you’re never getting anywhere. 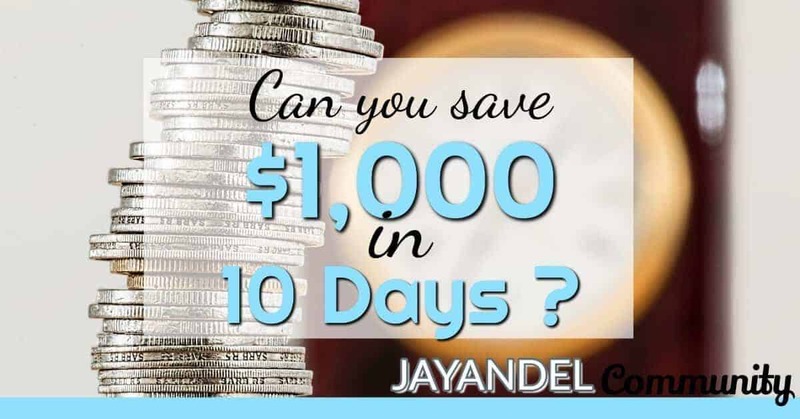 So to help you with your savings quest, with this 10-day challenge, we are going to kickstart your savings so you can save up $1,000 in just 10 days! Instead of going to the grocery store these next ten days, we are going to challenge ourselves to use up the food we have! We waste a lot of food around our home without even realizing it! This means throwing money away! Instead of going to the grocery store this week, try to make a meal plan based on only the food you have in your house. Go through your bills for the past three months. Are there any membership or subscriptions you are paying for? Of those subscriptions, ask yourself if you are really getting your money’s worth. Look for free alternatives to some of those memberships that will result in additional savings. It’s time to help reduce our eating out habits! If you eat out more than once a week, I am challenging you this week to eat just one meal out less. Keep a frozen pizza handy just in case, but reduce your eating out by one this week. It’s time to go through your home. Are there any items you are keeping for just in case or someday? Are you holding on to items you don’t need or use? Gather up these items and have a yard sale or sell them online. We are halfway through our challenge today! It’s time to start looking into some of your bills. Are you paying too much for your car insurance, cell phone, or any other bills? Give your providers a call and see about lowering your rates! Do you have a birthday or gift-giving occasion coming up? Instead of going out and spending $100+ on a gift, we are going to make a homemade gift for them for half the cost! Look online for some inspiration if you need to, and use your crafty and creative ideas to good use! Making items from scratch is going to nearly always be cheaper than buying it from the store. Items such as homemade pasta sauce and muffins take only a few minutes to whip up for a fraction of the cost! Instead of buying the storebought version, choose five items you regularly buy and try to make them at home yourself! It’s time to come to a harsh reality. How much money are you spending on entertainment costs? Look back at your bank statement if you need to and come up with a total. No matter what your total is, reduce that number by at least 50%. This could be a savings of $100 or more depending on your total! Instead, look for free or cheap entertainment in your area to help you stay under budget! Today we are going to do something drastic! If you have already cut your cable cord, then you are doing amazing! If you haven’t it’s time to cut out ANY paid service you are using to watch TV shows. This includes Netflix, Hulu, etc. Pause your service for just one month and see how you do without it. It’s the last day of our challenge and we are just $50 away from saving $1,000! The last thing we are going to do is do a no spend day. This means that outside of any bills that are due today, you are not to spend any additional money. No gas, groceries, or outside spending is allowed for today. Saving doesn’t have to be hard! And I hope by the end of this challenge you were able to save some money and kickstart your savings!